Artists, makers, and creatives of all types are invited to participate in one of two free upcoming Creative Placemaking workshops as part of the Artists on Main Street Initiative here in Northfield. Attending the workshops is the first step for creatives to apply for and potentially receive funding to support projects this upcoming summer and fall. The workshop will be facilitated by Michele Anderson, Northfield native and current Rural Program Director for Springboard for the Arts, and Sarina Otaibi, Rural Program Manager for the Preservation Alliance of Minnesota. 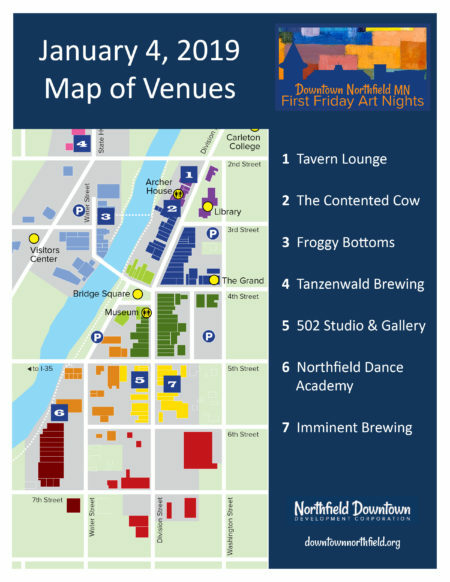 Attendees will learn more about creative placemaking in general, the Artists on Main Street Initiative, examples of projects funded in other MN communities, and the project parameters specific to Northfield. 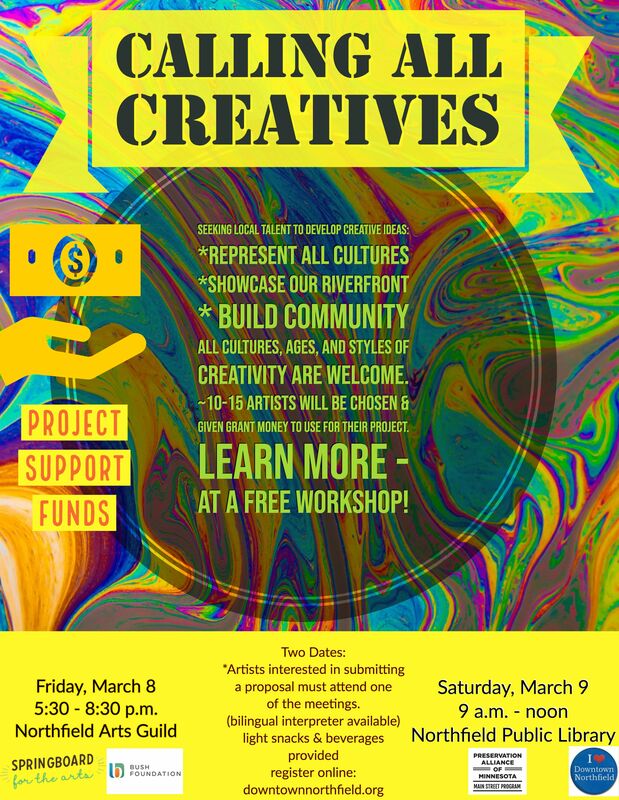 The name of Northfield’s initiative is “Connection/Conexión.” Project funding will be available to any artist, creative, or maker living or working within the Northfield Public School district boundary. Projects will use art, creativity, events or performances to help to draw people from across Highway 3 to downtown and create connections between people and places within our downtown. Projects should occur within the boundaries of 2nd street on the north, 5th street on the south, the railroad tracks on the west side of Highway 3 and the East Riverwalk/backs of Division St. buildings on the east. All cultures, ages, and styles of creativity are welcome! A full call for proposals will be distributed at the workshops. The project’s fund of $15,000 will support 10-15 projects that will be selected by a Public Art Review Committee, a process facilitated by the City of Northfield’s Arts and Culture Commission. Projects must be implemented between May-October 2019. Funding applicants must have attended a creative placemaking workshop in order to be considered for funding. Light snacks and beverages will be provided, and a bilingual Spanish interpreter will be available as well. The Creative Placemaking workshops will take place on Friday, March 8 from 5:30-8:30 pm at the Northfield Arts Guild, and Saturday, March 9 from 9 am-12 pm at the Northfield Public Library. Registration for the workshops is free, but attendees should RSVP to krlayman@msn.com if they plan to attend and indicate which session they will attend. The Northfield Downtown Development Corporation (NDDC) was awarded a $30,000 grant through the Artists on Main Street community development initiative in Fall 2018. The program is a partnership between the Preservation Alliance of Minnesota (PAM) and Springboard for the Arts, with support from the Bush Foundation. The program explores the intersection of arts and culture, downtown revitalization, and historic preservation in eleven Minnesota Main Street communities over a four year period. 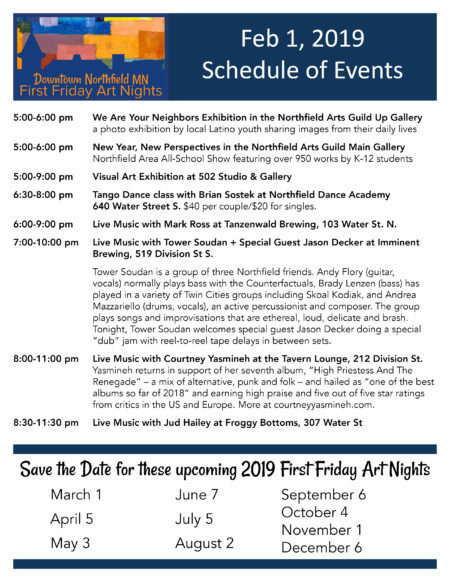 As the Designated MN Main Street organization, the NDDC will coordinate the Artists on Main Street program in collaboration with the City of Northfield’s Arts & Culture Commission and the Northfield Arts Guild. Minnesota Main Street is an economic development program of PAM that uses a historic preservation based strategy to revitalize downtown districts in Greater Minnesota communities. The program works with communities long-term and provides training and resources, including a Main Street Project Fund; to help community members revitalize their downtown. Springboard for the Arts is a national leader in creative community development. Their approach is rooted in the principles of community organizing and focuses on a “lots of little” strategy that surfaces unrecognized leaders in communities, builds public narratives from a multiplicity of perspectives and voices; and creates low-risk opportunities for collaboration. This equity-based model centers on the lives and experiences of the people in and of the place; values the relationships, partnerships, and creative capacity that artists and communities build together; and aims to build power and agency for individuals, neighborhoods and communities. 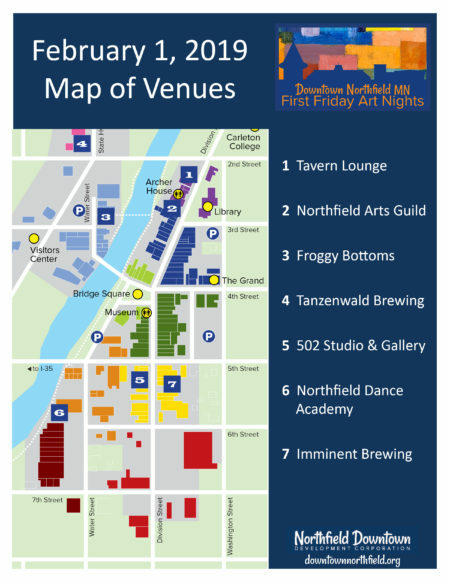 Warm up your winter weekend at First Friday Art Night on February 1st! Learn to Tango – partner not required, view visual art exhibits and listen to lots of live music! Executive Director Jenni Roney has submitted a letter of resignation to the NDDC board of directors. Her resignation will be effective January 24, 2019. Jenni had a number of accomplishments during her time with the NDDC. In 2017, she redesigned a favorite summer community event formerly called “Taste of Northfield.” Renamed “Downtown Taste Tour”, the event now has a format that has proven to be much more effective for both attendees and participating food establishments. That same year she orchestrated a project to upgrade the holiday tree lighting in Bridge Square. In early 2018, Jenni guided the NDDC through a successful application process resulting in Northfield being named a Designated Minnesota Main Street community by the state chapter of Main Street America, a national program of the National Trust for Historic Preservation. There are less than a dozen communities in Minnesota that have achieved this designation. Also in 2018, Jenni helped launch a new event program called “First Friday Art Night”. Using a combination of indoor and outdoor events, the program has highlighted the artistic talents of the community and attracted residents and visitors alike to the vibrant Friday night scene downtown. Most recently, Jenni wrote a successful application that awarded Northfield a two-year $30,000 Artists on Main Street Grant. This program will provide small stipends for 10-15 artists each year to be used to produce public art in the downtown district. A search for the next NDDC Executive Director will begin immediately. The holidays might be over, but the fun continues in Downtown Northfield this Friday! 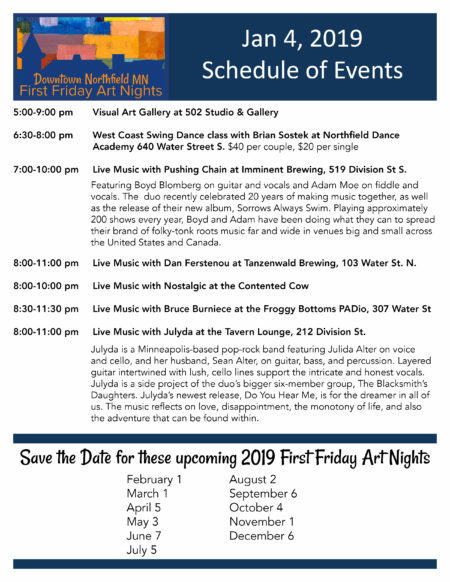 5:00-9:00 pm – Visual Art Gallery at 502 Studio & Gallery 6:30-8:00 pm – West Coast Swing Dance Class with Brian Sostek at Northfield Dance Academy $40 per couple, $20 per single. 640 Water Street S. 7:00-10:00 pm – Live Music with Pushing Chain at Imminent Brewing, 519 Division St S.
8:00-11:00 pm – Live Music with Dan Ferstenou at Tanzenwald Brewing, 103 Water St. N.
8:00-11:00 pm – Live Music with Julyda at the Tavern Lounge, 212 Division St.